Gazpacho - A recipe from Savor California, the online showcase for extraordinary gourmet foods and beverages from California. Combine all ingredients, except salsa. Leave chunky or blend. Top with Mrs. A's Salsa Buena. 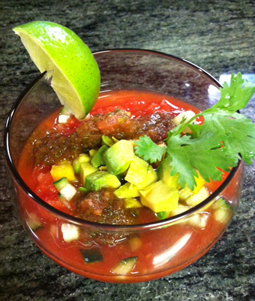 Optional garnishes: avocado cut into chunks, sprigs of cilantro, wedges of lime. * A can of diced tomatoes with the juice may be substituted.